Here at Beetham Dentistry, we are dedicated to providing our patients with the latest technological advances. We work diligently, advocating for early detection of cavities and gum disease. We are proud to say that we use the DIAGNOdent Laser Cavity Detection. This device is a high-tech fluorescent laser that aids in detecting caries (cavities) in their early stages. The Diagnodent® laser works by measuring changes in tooth structure, internal and external, and is ninety percent accurate in detecting early cavities. Cavities are an extremely common dental problem, and many people experience one at at least one point in their life. It is important to detect a cavity in its early stages in order to prevent it from causing any further damage to the tooth. Dentists have been treating cavities for centuries! Fortunately, DIAGNOdent laser cavity detection uses state-of-the-art technology to allow dentists to find cavities from the very beginning. What is DIAGNOdent Laser Cavity Detection? A DIAGNOdent laser is a fluorescent laser that helps to detect cavities when they are just beginning to form. This laser is able to find even the smallest traces of tooth decay, so Dr. Marianna Beetham will be able to begin treating your cavities before they begin to take any serious toll on your teeth. Dr. Beetham uses the laser to scan hard-to-reach zones in your mouth that may be more susceptible to cavities. When the laser detects abnormalities, it will make a beeping noise and emit a fluorescent light that will notify Dr. Beetham of any imperfections. Because the DIAGNOdent laser provides such accurate and immediate feedback, Dr. Beetham will be able to take quick action to remedy your cavity. When a cavity is found in its early stages, you can take advantage of only needing a small filling and of having a much quicker appointment. Thanks to DIAGNOdent, you can catch cavities before they really start to become a pain. As we already mentioned, early detection is one of the most important parts in fighting cavities and in maintaining your dental health. You’ll benefit from fewer and smaller fillings, as well as a lighter dental bill to pay when your procedure is over. But those aren’t the only advantages of DIAGNOdent laser detection. DIAGNOdent is 90% accurate, which means that you won’t have to suffer through long appointments that may have been made mistakenly because of a false alarm or an inability to find smaller cavities. It is also painless, as Dr. Beetham simply scans your teeth––you won’t be poked or prodded as you would during another similar exam. The lasers do all the work and let you enjoy a pain-free, quick, and easy dental session. The DIAGNOdent laser also detects very minimal decay so that you can attack it before it becomes a problem. Many other methods don’t offer such early detection, and may even skip over the cavity! An untreated cavity will only become larger and more painful as time goes on. With DIAGNOdent, you can rest easy knowing all of your cavities will be accounted for. You will even be able to set appointments for your treatment on the spot––before you even start to feel any pain in your tooth! This technology is a great way to stay ahead of the curve when it comes to keeping your teeth clean, healthy, and functional. The Diagnodent® laser is unique and no other product performs better. Because of this, you receive exact results for every tooth scanned. Furthermore, it is proven to be more accurate than just visual or X-ray cavity detection. It is over 90% accurate in detecting lesions not detectable with an explorer or bitewing X-rays. The DIAGNOdent allows treatment of questionable sites and sub-surface caries with confidence. Above all, the procedure is pain-free and preserves the teeth. 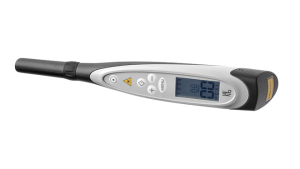 The Diagnodent® device is easy to use and can detect even the smallest of lesions. This is especially useful for the deep pit and fissure areas of the tooth. There is no probing or scraping. The laser gives us a simple scan that signals to Dr. Beetham with a gentle, audible alert. DIAGNOdent’s pen-like probe simply glides over tooth surfaces, constantly checking for the health of the tooth. A number scale and alarm signals for dental decay. Again, this technology is completely safe and pain-free. By using the Diagnodent laser, we can rest assured there is no hidden decay. Furthermore, this can head off any future potential problems, saving our patients’ tooth structures and improving their oral health. If you have any questions about laser cavity detection, don’t hesitate to contact us today at (425) 825-8800.